Live at The Estates at Sorority Row, literally the closest apartment complex to UF Sorority Row, located steps from sororities, UF classes, libraries, and Norman Hall. Each luxury apartment features unbeatable amenities including a gourmet kitchen with custom wood cabinetry and granite countertops, plus elevated ceilings throughout the apartment. You'll enjoy large master bedrooms with private bathrooms, oversized closets, picture shelves, built-in wine racks in most units, and pre-installed upgraded appliance package. Additional features might include art niches in the entryway, built-in bookcases, and large balconies with modern porch swings (select units). The Estates at Sorority Row provides comfort, luxury, and a prime location for UF students looking to live near Sorority Row. Apartments near UF go fast, so don't miss out on the chance to live in this highly sought after area. Not ready to settle for the average apartment? The Estates offers unique studio and 1-3 bedroom floorplans. The 3 bedroom floorplan is also available as a townhouse at the Estates Apartments. 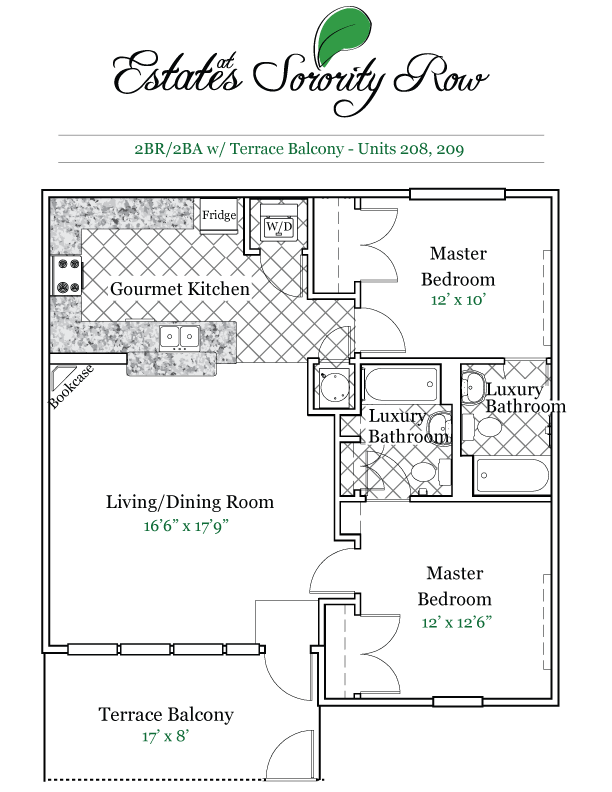 These luxury two-story apartments provide additional space to entertain and study. This layout also features an open air living room two stories high! An on-site parking garage allow those who sign up for reserved parking to leave your car in covered parking and simply walk across the street to your UF classes. Additional fees apply for reserved parking. Estates At Sorority Row is located and 0.43 miles from University of Florida. The property has a Walkscore of 56, so you might need to drive or bike some of the time. Estates At Sorority Row has many shops nearby. Coffee shops in the area include Starbucks, Lollicup, Volta Coffee, Tea & Chocolate. There are a number of markets in the area include Walmart, Publix Super Market at Esplanade At Butler Plaza, Publix Super Market at West Gate Shopping Center.